John 15:13 reads “Greater love hath no man than this: to lay down his life for his friends.” Fighting in the Great War ceased at 11 a.m. on November 11th, 1918, after approximately 10 million military deaths, 10 million civilian deaths, and another 20 million injured. A “hard Brexit” would involve the UK leaving the European Union and the European Economic Area. For Northern Ireland, that would mean (at least) customs checks at the border with the Republic. Politicians on all sides are concerned about what that might mean for the peace, but the split is encouraged by the board above on the “sports zone” next to the Mount Inn on North Queen Street, Belfast. The Navy and RAF ensigns perhaps suggest how the UK’s borders are to be secured. UDA members John Fulton and were Stephen Goatley were killed together in the Alexandra Bar on York Road (close to the Mervue Street location of this memorial) by the UVF as part of the UDA-UVF feud in 1975. The poppy is more often associated with the Ulster Volunteers (of WWI) and the UVF. Here are two images of memorials dedicated to local residents without any apparent connection to politics. 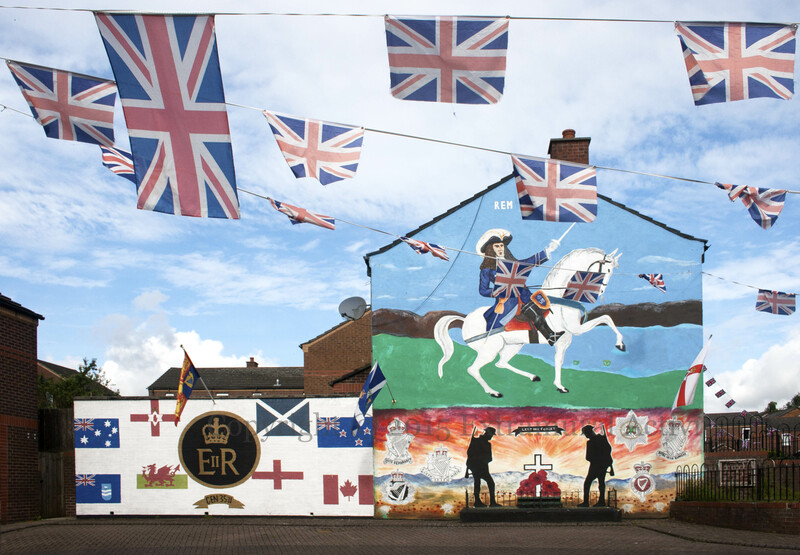 The picture above shows a painting of poppies on the garden wall of Susan Davidson’s house in Tigers Bay, Belfast. The image below is of a plaque in Creggan, London-/Derry/Doire to Billy and Shiela Quigley, who died in a car cash in 2004. For “Vote Leave” on the gable, see Brits Out! “Come out of her, my people, lest you take part in her sins, lest you share in her plagues” — commentary on the “Brexit” vote, coming up on June 23rd, from the Tigers Bay community in north Belfast, likening the EU to Babylon — “Babylon the Great, the Mother of Prostitutes and Abominations of the Earth”, “the habitation of devils, and the hold of every foul spirit, and a cage of every unclean and hateful bird”, “that great city, which reigneth over the kings of the earth” — whose destruction is prophesied in the book of Revelation. Hence: “Vote Leave E.U.”. 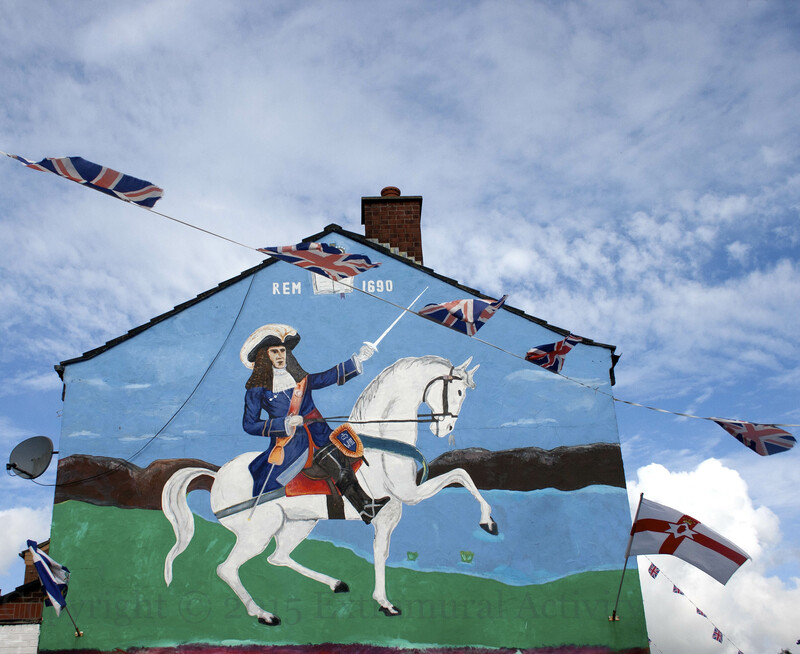 This fine example of King William III at the Battle of the Boyne completes the Tigers Bay trio of murals from the past two days (see You Will Become A Great Nation, Even Many Nations & North Of Ireland Armies). Shots of the three together and of the general scene are included below. For the UDA mural previously in this location, see M04396. Like yesterday’s array of flags, the adjacent mural of army badges around a burial scene from the first world war features some lesser-seen items. On the left, alongside the Royal Irish Rifles (top left) and the (modern-day) Royal Irish Regiment (at the time of WWI the harp was plain and there was no garland), we see the emblem of the North Irish Horse, a cavalry unit in the Territorial Army. On the right, the emblem of the Royal Irish Rangers (which was folded into the Royal Irish Regiment in 1992) is joined by the star of the Irish Guards (above) and the emblem of the Ulster Special Constabulary or B-Specials (below). Only the Royal Irish Regiment and the Irish Guards remain as regiments of the British Army; “The Horse” now forms squadrons of other units. Of the six, four served in WWI; the B-Specials were formed in 1920 and the Rangers in 1968. Genesis 35:11 reads (NIV) “And God said to him, “I am God Almighty; be fruitful and increase in number. 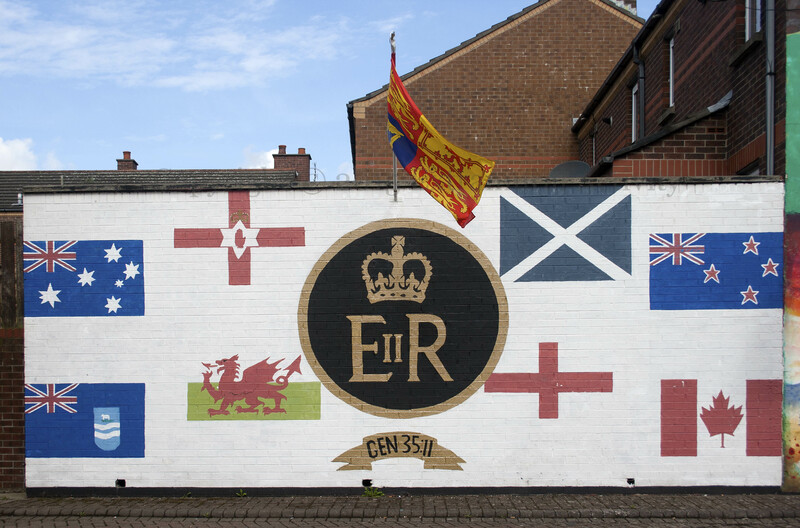 A nation and a community of nations will come from you, and kings will be among your descendants.” The flags of Northern Ireland, Scotland, Wales, and England are joined in the mural above by those of Australia and (a simplified version of) the Falkland Islands (on the left) and New Zealand and Canada (on the right). 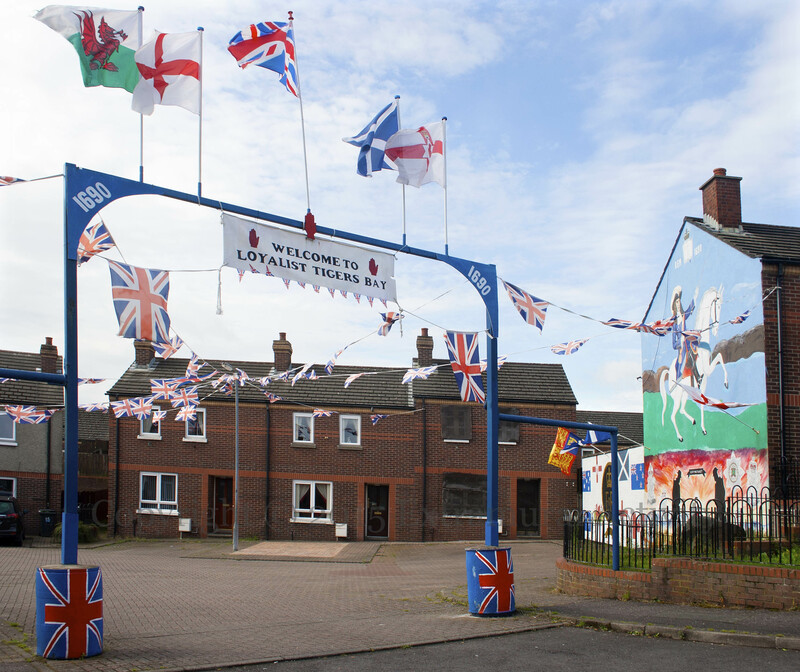 The flag flying in the centre is the Royal Standard, flown on the building or vehicle where the monarch – currently EIIR, Elizabeth II Regina, Queen Elizabeth the second – is. 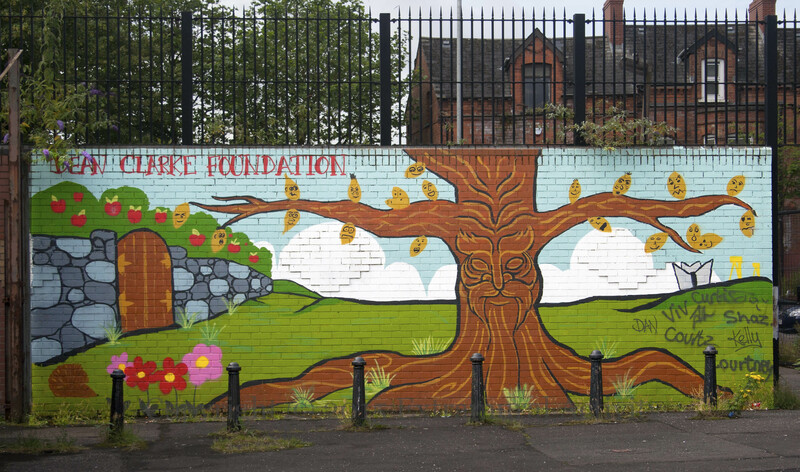 Treebeard the Ent (from Lord Of The Rings) watches over the young people of north Belfast’s Tigers Bay. Dean Clarke, age 16, hanged himself on November 4th, 2007, after a week in hospital recovering from an overdose of ketamine (which he believed to be valium). The Dean Clarke Foundation (Fb) was founded by his mother Alison in order to provide activities and outings for young people. (BBC-NI | Tele) The foundation iss also involved in the Tigers Bay community garden (see Work Ethic). Have you spotted a mural or piece of graffiti? If you have any information about a mural/graffiti/street art, please leave a comment on the post. Questions, too. We are also available for talks (and tours) to schools and other groups. Some of the most familiar murals are listed together just below 'For Beginners'. Completists should check out the Extramural Activity map of murals, graffiti (both those featured on the blog and others) plus "peace" lines and re-drawn estates of the past. Please help defray our costs! See our Visual Histories of the Jackson murals, Free Derry Corner, The International Wall, Northumberland Street, Iron Maiden's Eddie The Trooper, Walter Paget's The Birth Of The Irish Republic, and more.